Imagine if you could bring a slew of virtual experts around with you and ask them for advice whenever the need arose. Although that sounds like futuristic technology, a new app from Esquire magazine shows that it’s a world right around the corner. 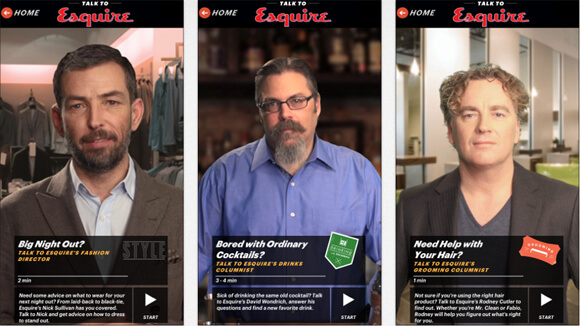 The free mobile app called “Talk To Esquire“ allows iPhone and iPad users to interact with one of the magazine’s three experts: fashion director Nick Sullivan, drinks writer David Wondrich, and grooming columnist Rodney Cutler. Once activated, video of the human experts plays and prerecorded follow-up responses are triggered through user’s spoken answers. The aim of the app is to create the impression of holding a conversation with the virtual experts through the combination of speech recognition, artificial intelligence, and lots of video. The maker of the app, San Francisco-startup Volio, uses natural language technology akin to Nuance, the maker of the tech behind Siri. Perhaps not surprisingly, both ventures are founded by the same man, Ronald Croen. “It’s a voice-guided ‘choose your own adventure,'” explained Esquire Senior Editor Richard Dorment to Mashable in an interview. It’s not hard to see how far the technology could go. Anyone who is an expert could virtualize themselves through video to address user questions as a way of promoting themselves. Beyond simply advice seeking, fans could also download their favorite musician, writer, or movie star and conduct virtual interviews that feel like real experiences. It’s hard not to think of an industry that couldn’t utilize this tech — even politicians could utilize it to get their message across or communicate their stance to constituents. The startup calls this new kind of experience “participatory video” and it could revolutionize more than talking heads. Automation has been slowly replacing manual labor and task-oriented work for decades, but customer relations has been viewed as a safe haven for work because of the complexities of human verbal and nonverbal communication and the desire for face-to-face human interaction. Yet, this virtual assistant technology is a perfect hybrid by retaining the human side of relational aspects but relegating the problem solving part to the computer. The potential for this tech to find its way into consumer industries is huge, but it could also revolutionize education, either for teacher lessons or how-to tutorials, such as the popular videos that are behind the Khan Academy’s success. Clearly natural language processing and virtual conversations are one of the next big breakthroughs for computing, as Google Director of Engineering Ray Kurzweil recently indicated in an interview. The Esquire app demonstrates great potential for this tech even as it opts for the humble beginning of helping men with grooming tips.